As a title, “Romantic Language” first appeared in WU Di’s work in 2014: she made use of printed matters, acrylic paints, pencil, mark pen to combine images of different textures together with various texts. The most remarkable among which is a pair of arms lying in a disordered time and space, connected by a curve between finger tips, indicating a sense of speed of the movement. In 2006, the forth year after graduating from China Academy of Fine Arts, WU Di became a professional artist. Emphasizing on independency, her early works were rebellious, full of bloody, filthy and scattered elements that would cause discomfort, and her works were very often related to gothic religion or the ultimate proposition of death. In 2012, WU Di, together with LIU Bin and BAI Moti, started a fashion label named “BLACK BRIDGE” (black bridge used to be the largest cluster for artists in urban-rural intersection area of Beijing and was gradually cleared away by the government in 2017). They “transformed” the rich image resources from classical European art and applied them to contemporary vintage designs, and their products immediately won market acceptance. In the aspect of personal artistic creation, WU Di’s cynicism became subtle in recent years, or integrated with a strong sense of critical thinking. The “shout of youth” was replaced by some chattery ambiguity and sarcasm without swearwords, in the mean time, more exhibition experiences make her study of multi-media such as paintings, space and installations more in-depth. During the end of 2018, WU Di is once again indulged in “romantic language”, and created a set of works centering on unidentifiable “texts”. She paints and transforms the texts in order to deprive the signifying function of the symbols in her works, and places her hope on the audience who can be mentally connected. Thus the “Romantic Language” needs to be seen not to be read. “Sunset comes, but never the same” is a quote that often used by WU Di in her interviews and self-statements, whereas in this exhibition, she names the only space artwork after this quote — an exhibition space which is surrounded by tangerine glasses. 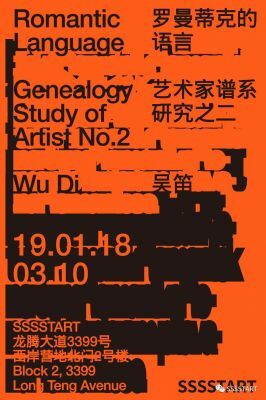 “Genealogy Study of Artist” is a research project on artist creation brought out by the preparation team of Start Museum on October 2018. This project innovatively establishes a continuous academic research platform that is based on the interrelationship between the genealogy of the artist and his/her artistic creation. The project provides a random view towards the case study of an individual artist, capturing a slice of the present status of the artist’s creation and periodic achievement, and objectively scans the historical moment of self-challenging of the artist. By relating the personal experience, the source of knowledge and the logic behind the artistic thinking, the project intends to build up a foundational research on the artist, through which an observation and discussion over the various factors that would affect the process of creation of the artist and their relationships are made possible. The project intends to research on the exhibition artworks, publications, audio and visual archives, as well as the previous archives of the artist, in order to depict the artistic production of the artist in multiple ways. The first exhibition of the “Genealogy Study of Artist” — “Lou Shenyi: Pleasure” is completed from November 2nd to December 23rd 2018.